Vacation is a time for rest and relaxation. 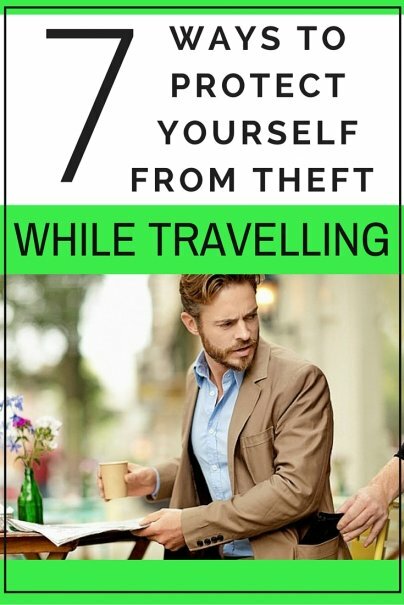 But your good-time getaway can quickly turn into a living nightmare if you're the victim of theft while you're away from home. Lock down your loot and guard your identity when you travel abroad with these helpful tips on how to protect yourself. Listen, we all know you're a baller with the big bills on vacay, but let's keep that our little secret. The less money you flash around in public, the fewer chances a would-be thief has to target you. "I always kept my money hidden, and never ever pulled money out," says frequent traveler and blogger Stephen Roe, who lived in Tijuana, Mexico for five years without becoming a victim of theft. "Other Americans would pull out a wallet to pay. I would always choose to select the money in my pocket and only pull out the amount I needed. That way, potential criminals wouldn't know how much I had." Roe adds, "In addition, it's best to pay in the local currency whenever possible. Whipping out American dollars, even if it is accepted, can mark you as a potential target." Travel author Susan Schenck suggests a similar strategy with your debit card. "When going to an ATM, have the card in a money belt," she relays. "Make sure there are no loiterers around the area, though often they are even across the street. Go into the bank to count the money. There is a security guard there, often with a gun. Then place it all in your money belt. This is critical. I have so many friends who stuck the money in a pocket only to find it was gone when they got home. Pros can pickpocket you without your feeling anything. Keep the money belt well hidden under your pants." First, never use a debit card abroad. If it gets stolen, your funds can get depleted and it will take time for the bank to release the funds, if they decide you weren't responsible. Trying to settle these types of matters while you're on vacation abroad is definitely not ideal. Travel expert Ferdinand Goetzen suggests avoiding using your card in questionable places. "This is especially important when traveling in less developed nations," he says. "Payment security infrastructure can often be lacking so it's best to avoid using your card unless it is a trusted venue or bank." But credit cards can be helpful when used in safe environments, and can be a better alternative to carrying cash around. It's better to lose a credit card than cash. Credit card companies typically don't hold you accountable for fraudulent charges, as long as you report it quickly. Keep track of your cards carefully so you know if you've lost one, and set up alerts to notify you of purchases so you can see right away if someone has stolen your card information. Taxis and nefarious taxi drivers can cause unnecessary trouble if you don't keep your wits about you. Schenck advises to write down the cab number before you get in for reference if you accidentally leave something behind. When exiting a cab, if you have luggage in the trunk, do not get out of the cab until the driver does; they've been known to high-tail out of there with your valuable belongings in tow. And never ask a taxi to wait while you go to the ATM if you leave stuff in the cab. "One friend lost her laptop that way," Schenck says. Want to trick the trickster? Have a fake wallet with outdated credit cards and maybe $20 in it that you can hand to anyone who holds you up. They want a quick getaway and aren't going to sit there and check the dates on the cards, says Schenck. Well, maybe not in the sense that you're thinking of, but it's not a bad idea to keep a $20 bill in your socks, bra, or other safe, close-to-your-body area in a hidden garment in the event that you're robbed. Twenty dollars goes a long way in many countries, and you'll at least be able to get home or to the nearest police station. "One of the most common thefts occurs when people leave valuables in their main luggage and leave it in the hotel lobby or in the baggage compartment on buses or trains," Goetzen warns. "I always bring a small backpack with all of my most important belongings because I don't like to let them out of my sight." Also, stop assuming that your belongings will be safe with the friendly, nice-looking people next to you at transportation hubs while you go to the bathroom. Even friendly, nice-looking people steal things, and you'll be quite S.O.L. (and super P.O.ed) if they gang the bag with your tickets, passports, and wallet while you're taking a whiz. Don't travel to areas that aren't policed, stay out of dark alleys, and don't go anywhere with anybody you don't know. Don't drink so much when you're in unfamiliar territory either. It makes you do stupid things and make poor decisions, and you become a sitting duck for criminals. Your mom totally would've told you so. Do you have tips on how to protect yourself when traveling abroad? Let's discuss in the comments below. I never wear jewelry when travelling, just a cheap watch, to avoid attracting attention. If always put my locked, wire-mesh lined, backpack that has my laptop in the overhead for the seat ACROSS the aisle from me when I can. That way I can see if anyone tries to open it. I keep the laptop in a bag, and even put "bear bells" on the backpack so anyone rustling it will make a little more noise than they care to.